Megumi's Stampin Retreat: Spring Workshop - URGENT UPDATE! 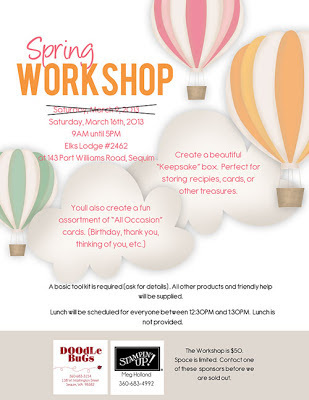 We have just been notified by the Elks Lodge that they have double booked their facility for March 9th and must therefore change the date of our Spring Workshop to March 16th. We do realize many of you have already made arrangements in your schedule to attend, yet may have not purchased your ticket. We sincerely apologize for the inconvenience this may have caused you. We were left with no other option but to change the date or cancel the workshop. Please contact us if you have any questions. At this workshop, you will remain at the same table the entire day. All supplies and tools to complete the projects will be at your table. Please bring only your basic tools and adhesive. There will not be time or space to work on your own projects. Thank you for your understanding. Please contact me with any questions regarding this change.